Nobody passed through unscathed in this week’s Winter Quads. Expert Kapil Chandran joined National Masters Daniel Lowinger and Ian Harris, as well as CCFC Director Melvin Patrick in what would turn out to be a thrilling quad. 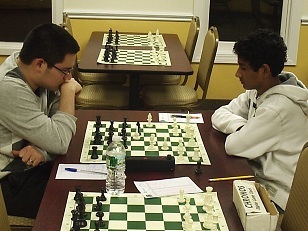 The Harris – Chandran round one match-up was intense! Black got a quick opening advantage but then missed a tactic which handed the advantage back to White. The game quickly became a mess of tactics. Although Black’s King was surrounded by a hoard of White pieces, Harris had trouble finding a straight-forward path to victory and almost allowed Chandran to escape. In the end he had to simplify to an endgame to bring in the full point. Chandran recovered nicely in round two in his game against Lowinger. The two reached a complex endgame and in time trouble Lowinger missed the best continuation which allowed Chandran to get up an exchange in a pawn endgame. However, the position was deceptive and the win was not easy. Lowinger created complications and was able to hold onto the game in the end. Everything went according to plan in the final round. Congratulations to Daniel Lowinger!